I admit it, the taste of coffee, I am addicted: it's my only addiction, well I do an aspirin O morning fo rmy heart, but that brings up the other thing, coffee, yes coffee , is not good for my heart, but hey my addiction! At first, West's estimate sounds like a huge exaggeration, but he's quick to follow it up. "When we first built the facility, we cupped so much in one day that I went home calling my brother thinking I was having a heart attack," West says. "I had about 600 cups of coffee and my heart was racing." Tim Hortons wants Canadians to know that, like its coffee tasters, it's critically serious about coffee. The country's biggest restaurant chain is in the midst of an intense battle for the lucrative coffee products market, facing competition from both low-priced and higher-end rivals. At several points in the process, West steps in with his taste buds at the ready, looking for any brews that don't fit the profile. The procedure begins in the morning when he and his team of four other "cuppers" gather around a stainless steel Lazy-Susan that's equipped with built-in sinks that bear a slight resemblance to the spittoons at your dentist's office. The table top is covered in a neatly arranged circle of coffees made with beans from around the world -- Columbia, Brazil, Guatemala, regions of Africa. A top-secret formula determines which quantity of each bean go into making the blend that has defined the Tim Hortons flavour. Each cup on the table has been steeping for exactly five minutes before the team "breaks the crust," or removes the floating coffee grounds, and begins their flavour critique. how do you know it's too much? I'm not a coffee drinker - I love the smell, but hate the taste. Same with tea - though my friend is trying to convince me otherwise (I'm not a fan of hot drinks - but weak tea with milk and two sugars isn't too bad!). Though I do have experience with coffee shops - my friend is obsessed with Starbucks, so whenever we're in a place that has Starbucks (our town doesn't have one - Coffee Evolution is the place of choice for most people. They have awesome smoothies, so fine by me!) we have to go in. I like trying their range of non coffee drinks - fruit juice made with tea is yummy, but I'm addicted to the strawberries and creme creme drinks (non coffee frappuccinos basically). Noooooom. Most coffee shops do some kinda fruity/smoothie drink nowadays, so there's usually something yummy for me to try. How to know when you're drinking too much coffee - my old housemate's theory was "when you get to the bottom of your mug it's time for another cuppa". He had to switch to tea after he started getting caffeine shakes, and couldn't sleep without the caffeine! I don't drink coffee because it doesn't taste like it smells. Breyer's coffee ice cream tastes like coffee smells, and I enjoy it occasionally. Okay, I'll drink the occasional cup. Twice a year I head to Harris Ranch for the buffet, and will request a half cup of black coffee for my small plate of tiny dessert bits. Once I realized that the desserts had enough sugar and cream, I tried the black coffee, found I liked it, but not enough to drink regularly. I usually have one big cup a day. According to my automatic drip coffee maker, my one cup equals close to three 6 ounce cups. Sometimes I'll have another 12 ounces during the day. When I'm at my mom's my intake can climb as high as 4 cups - but not usually. 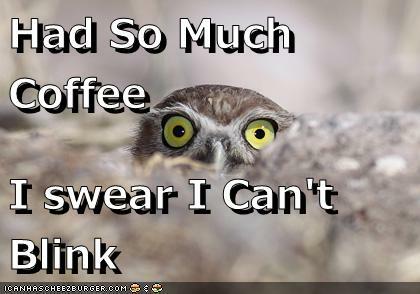 Only time I ever gave myself coffee jitters was when I was drinking the stuff to stay awake. It's the same feeling as taking no-doze, and likely for the same reason - concentrated caffeine. Caffeine jitters are scary and awful and hard to sleep off. LOL Alica-I'm guilty as charged-I'm Alica's Starbucks obsessed friend-it's true I love Starbucks and I hate coffee and espresso-the taste is so vile it's ridiculous but I absolutely go nuts for all the soya caramel Macchiatos with so much caramel drizzle that you're probably getting a sugar high off the mythic proportions of caramel in my drink just from smelling it. My descent came when my university got a Starbucks on campus-at the height of my addiction I was in probably at least 3 times a day sometimes more. The Baristas knew me by site and what I would be drinking. I did put on a lot of weight though (along with the burger king habit as it was the cheapest food on campus at the time-and I was on campus usually for 9 and leaving at ten at night for at least 3 days a week - so I was eating burger king three times a day on those days plus going to Starbucks 3 times a day-can you say heart attack on a plate and OMG spending way too much money). After my doctor scolded me for my bad eating with a reality check on my high cholesterol, I cut down on both the fancy Starbucks drinks and stopped going to Burger king and opted for Subway or the new Greek place that opened up on campus(delicious homemade greek food=healthier than Burger King). Starbucks became my once or twice a week fancy drink place and tea the rest of the time(because I love tea more than coffee)until I moved to England and now I make my own brews at home and visit the Coffee Ev in town(because they don't forget to give me soya and charge me extra for it-it's the same price as a normal latte) I only have Starbucks when I go out to Manchester or Sheffield with Alica now- and it's a soya chai tea latte since I got pregnant-baby does not like espresso at all. Too much coffee is when you can't go without it and you'd rather make yourself poor to visit the nearest Starbucks with your friends. Firm rule - no coffee after 2:00 unless I'm really desperate for caffeine. I have a couple of large cups in the am of strong coffee with milk only - at home. Or if I had to skip home for some reason, usually medical tests, or I'm out and need a lift, will treat myself to an iced latte with extra shots. More than that gives me the jitters. Lifetime habit of coffee with breakfast, just the taste combination I want. After that, I'm in it for the caffeine! If tummy is being iffy, will have strong tea instead. Hey I didn't name you you could have fooled them all! ^but where's the fun in that!! I am not ashamed to admit that I like Starbucks and I like going there with my friends. Besides I have my addiction mostly under control now... Oh wait mebbe not! I developed a taste of iced coffee about 15 years ago, when due to a stomach injury, I couldn't drink anything hot or carbonated. And me without caffeine isn't something anyone ever should see. I do have to watch it a bit, as iced coffee actually has enough to give me a bit of jitters. Never developed a taste for drinking coffee but that might be due to the fact that at a very young age (don't know but before age 5) I decided to drink what Mommy did and burned my mouth and tongue. Not severely but enough to develop an aversion to the stuff, maybe, as a result? I like the smell though and that maybe came more from the years with the ex and his taste in coffee? Even learned to make it for him...but never to drink it. I'm surprised how many of you are mentioning, smell - I never really thought of it, but I'm sure I reacted to it, subconciously; smell it and say HEY I Gotta get my cup too! I have noticed how food on sale is sweet; I don't mean cookies oh no, I mean stuff that in the past was very not sweet; I mean Sauce! go shop sauce for pasta, or even chili; notice the ones that really want to sell volume; they make it sweet. In other words, they make just any food, not dessert, even main course stuff , Sweet, and they sell volume; people go for the sweet! their marketing tells them, so they go more and more, more sweet; sell more volume. and then Let's mention the big S, S(tar) in the room, that corner java place; just HOW Much sugar to they purvey to us each month?! ^Most Italians or those with Italian/Sicilian ancestry prefer a sweeter sauce. Not overly sweet like some of them on the market but a bit more sweet than most people would think. I don't like mine too sweet but I know the sauces I make get about a teaspoon or two of sugar(to cut down the acidity of the tomatoes) and a good dash of tarragon(it's a nice sweet tasting herb which I find balances out the oregano and basil nicely). And wine or or port-mmmmm must make sauce soon. I wish coffee tasted as good as it smelled-I find coffee on it's own to be way too bitter(as I do tomatoes-which according to most people are sweet-they think I'm crazy when I tell them they are really bitter and nasty tasting(save the sungold cherry tomatoes my mother-in-law grows-those are sweet). We don't drink coffee because it's not good for our health. ^good on you! It's the only food related vice I have. I have to have my caffeine-which in my current condition is severely limited but I feel so horrible unless I have my tea in the morning. I used to only drink the tea in the am but I developed really bad sinusitis and my doctor said to me "tea with honey as often as you can stand it because apparently honey helps keep the sinuses clear(which meant less visits to the doctor and less medicine for me) which then got me hooked! It beats the sinus infections though. obs - my mum reckons she's not awake before her two cups of tea in the morning. Just when I was about to get a single serving Starbucks vanilla ice cream the other day, I saw the Starbucks coffee, but it was a pint, not a single serving, but I bought it anyway and promised myself I'd only eat half. Unlike the Breyer's I mentioned above, Starbucks packs a wallop. I think I must have eaten 8 espresso shots. More coffee than I drink in three or four years. Worth it. One time only experience though. Coffee, I love coffee, rich, dark, Italian coffee - [one of the best cups of coffee I had was when I was last in the US with Nikki and we were waiting for our very delayed Amtrak train]. The UK is still big on 'instant' coffee which is not really coffee, I like my coffee real, freshly ground, I want the aroma of the coffee to waft through my house [I set my coffee maker for Sunday mornings so that I am woken up by the wonderful smell]. Since all my medical drama I find that caffeine does not agree with me, I try and restrict my intake to one cup a day, but it's so hard, I miss real coffee, de-caff [which still contains caffeine!] doesn't cut it. I tried green coffee bean extract for weight loss last month. Supposedly the small amount of caffeine doesn't bother, but I'm guessing that promise is only good for those who already consume caffeine. But the really shocking bit is that I've been increasingly forgetting to drink it at all! That's like forgetting to appreciate a lovely lady. It should be physiologically impossible! Yet I've noticed myself going a week or more --it just didn't seem worth the trouble. Yesterday and ther day before were my first two back-to-back coffee days in a while (mostly due to eating out) and now at 3:30pm I'm about to make my first cup of the day for the hat trick! I'm pretty sure this is one of the lesser signs of the apocalypse.